Lomandra is a genus of native grass-like plant. There are 51 recognised naturally occurring species. They tend to be very hardy plants with deep and dense root systems making them ideal for slopes or erosion prone areas. Most lomandras are adaptable to either sun or shade and can be very tolerant of both extreme dry and extreme wet conditions making them very versatile. Plant breeding has given us a diverse range of lomandra cultivars. Only a handful of species are suited to cultivation, but this handful has led to the development of a wonderful profusion of cultivars. Lomandras can now feature in gardens all over the country and in all types of gardens, to great effect. Variable amongst the cultivars is leaf colour, in addition to height, form, leaf slenderness and even flower profusion and perfume. This allows us to create diverse and beautiful gardens with lomandras as either feature plants, mass planted or as accent plants. Lomandras can be very compact plants in a variety of sizes so can work very well in both formal and informal gardens. 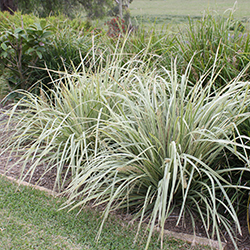 Lomandras can fulfil the function of an ornamental grass in a garden due to their slender leaves and grass like growth habit, which can make them very useful in Queensland gardens where many ornamental grasses struggle and we have limited choice when featuring grasses in our landscapes and gardens. The hardiness of these plants means that they can be used in harsh settings such as median strips, and perform well with little to no care. Not all lomandras however are suited to all areas and situations. 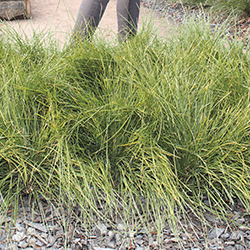 Plant breeding has also developed lomandras for different growing conditions and the suitability of a species or cultivar for your growing conditions is also critical when choosing the lomandra that is right for your garden. In Queensland those conditions can include extremes of wet and dry, high humidity and susceptibility to phytophthora (root rot). While most lomandras are tolerant of extremes of wet and dry, humidity and phytophthora resistance can vary enormously. To make selection easier, the following information summarises lomandra cultivars best suited to growing in Queensland. One of the larger lomandras, reaching 1.5- 1.8m high, this lomandra is very well suited to Queensland. It tolerates a wide range of conditions and soil types and has the bonus of abundant perfumed flowers. Katie Belles™ is receiving much attention as a very beautiful as well as very hardy plant useful in mass plantings or as a feature plant in wet and dry landscapes. It is the best performing, evergreen Australian native rain garden plant and is phytophthora resistant. 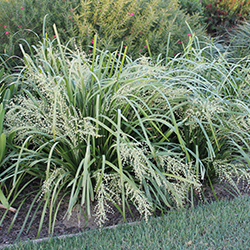 This is the only recommended variegated lomandra for Queensland and a reliable performer elsewhere as well. 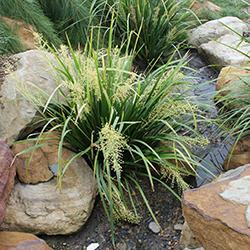 Growing to approximately 1m, it is a very clean lomandra with beautiful variegated foliage which does not discolour in humid conditions. For a hardy and reliable plant with variegated foliage this is a hard plant to beat and can be used to very dramatic effect in a garden. Again this plant is resistant to phytophthora. Tropic Cascade is well suited to tropical and subtropical regions. It grows to approximately 60cm and is a compact form with a delightfully weeping habit to the leaf from which it derives its name. This lomandra also features perfumed flowers. It can handle periods of inundation so is valuable for soil stabilisation in flood prone areas or by watercourses. This is again a lomandra that is resistant to the phytophthora disease. Growing to 45cm this compact lomandra is a stand out performer in humid conditions and has excellent phytophthora resistance, in fact it is one of only 2 lomandra varieties in Australia to show 100% resistance to the disease (at the time of writing no deaths have been recorded as a result of phytophthora). The fine blue- green foliage and masses of small yellow flowers make it highly ornamental. Shara™ is one of the most reliable plants with blue tinged foliage for Queensland. The fine foliage of this plant is softer than most lomandras making it suitable for planting beside pathways and in children’s gardens. A fine leafed form of L. longifolia, in a small compact but very hardy bush to 40 or 45cm high. It performs well in the subtropics and has shown to work well in Darwin, so it is expected to do well in northern Queensland, more testing is required, but has so far shown that it should perform all over Queensland. This is the second of the two varieties of Lomandra that have shown 100% resistance to phytophthora (at the time of writing no deaths have been recorded as a result of phytophthora). 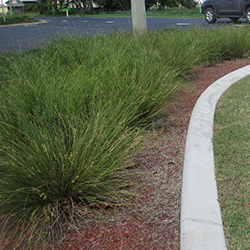 The compact size of this lomandra makes it well suited to roadsides, as it meets line of site requirements, is very tough, and drought and wet feet tolerant. It is also ideal for small gardens and pot culture.